SAUNDERSTOWN FERRY: “Summerfield” is a 3.1 acre country home surrounded by nature in a quiet enclave of Saunderstown Ferry. Few properties offer this level of serenity, efficiency and joy of living. Set among country paths, fields and wooded landscape, this haven of luxurious privacy inspires the comfort level of resort living.This four bedroom farmhouse is meticulously maintained, with recent updates featuring a new master bath, granite kitchen, generator, hot tub, heated Gunite pool and updated systems, solar enhanced for superb energy efficiency. Cathedral ceilings, large windows and open floor plan create a sunny, uplifting interior.The generous finished basement features a gas fireplace, a custom mahogany bar, space for a home gym or media room. Additional guest quarters with full bath are accessed by a separate entrance.The outdoors is equipped for your pleasure, with a well-established vegetable garden inspiring wonderful dinners for summer evenings under the stars. Plunge in the heated pool for a moonlight swim. Enjoy a woodland walk and capture a birds-eye view of the three-acre property from the tree house. Bike to Carpenters beach, Saunderstown Yacht Club and Willett Library. RI's best ocean beaches are a short drive away. 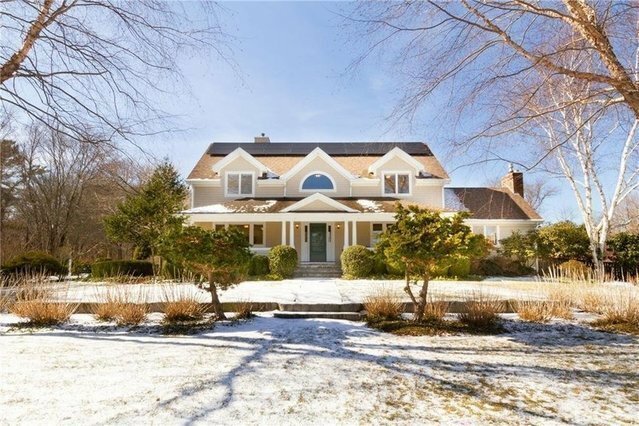 This perfect location has made “Summerfield” a lucrative rental during the summer months.A treasure of tranquility and quality of life, Summerfield is a perfect spot to enjoy the best of Rhode Island. Easy highway access to Boston, New York.